Giulio Giancola first appears at Fairport Harbor, Lake County, Ohio, in 1925. He moved from Ashtabula, Ohio, to live with his uncle, Michele Rossi, who was living in Fairport Harbor. In America, Giulio Giancola was known Julius Giancola. Giulio Giancola, son of Benito Giancola and Maria Rossi, was born on Sunday, February 24, 1895, at Cerro al Volturno, Italy. Giulio married Bettina Izzi, daughter of Serafino Ezzi and Florinda DeGeo, at Cerro al Volturno, Italy. Giulio died on December 24, 1949, at his home, 426 Second Street, Fairport Harbor, Ohio, at age 54, of carcinoma of the bronchus. 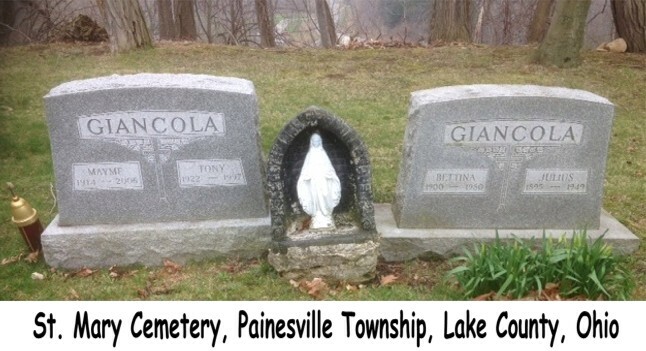 His body was interred at Saint Mary Cemetery at Painesville Township, Lake County, Ohio. Giulio Giancola immigrated to the United States on December 3, 1923, at age 28, travelling to Ashtabula, Ashtabula County, Ohio. He was joining a cousin in Ashtabula. Giulio Giancola became a citizen of the United States in 1930. Giulio resided at 208 Vine Street, Fairport Harbor, Lake County, Ohio, when he was naturalized. 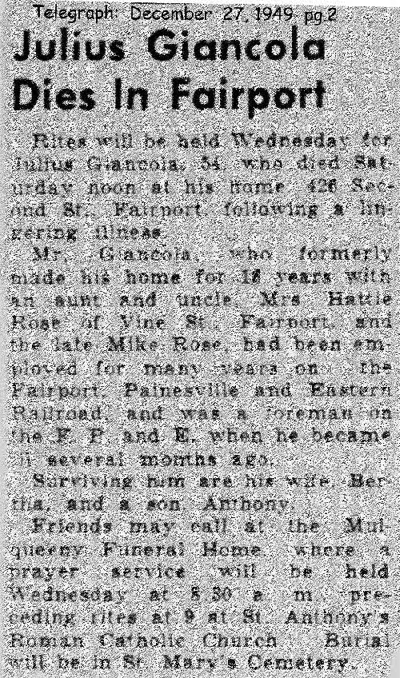 Mr. Giancola lived with his Uncle Michele Rossi, and his wife, at Vine Street, Fairport Harbor, Ohio, from 1925 until 1941. In 1940, Giulio’s son, Olimpio Antonio Giancola immigrated to America, and moved in with his Great-Uncle Michele. About 1941, Giulio’s wife, Bettina Izzi immigrated and the family moved to Second Street in Fairport Harbor. Mr. Giancola was employed by the F.P.&E. Railroad Company at Fairport Harbor for many years. When Giulio Giancola immigrated to Ashtabula, Ohio, in 1923, there was a large community of immigrant Italians who were born at Cerro al Volturno established in Ashtabula. Giulio’s mother was Maria Rossi. 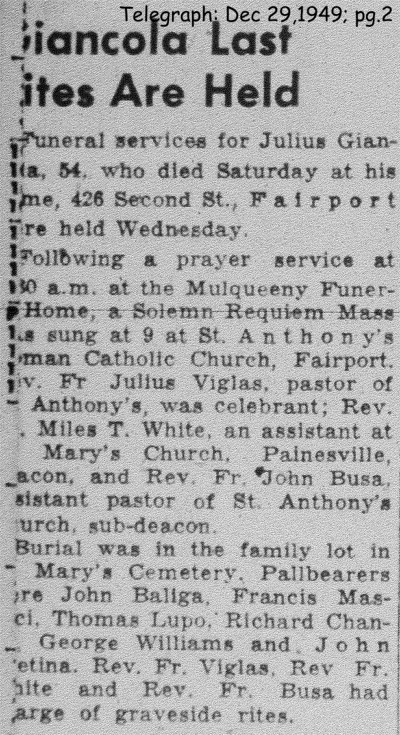 My maternal grandmother’s father, Francesco Paolo Rossi, was born at Cerro al Volturno and lived in Ashtabula in 1914 when my grandmother, Lucia Rossi immigrated, joining him in Ashtabula. ROSSI is the most common of Italian surnames, but Giulio Gaincola may have been related to my grandmother.